National Merchants Capital is built from a team of successful and experienced business owners who understand how difficult it is to succeed as a small to midsize business in a troublesome economy. In 2009, this group of professionals came together with the common goal of helping small businesses reach their fullest potential. Choosing NMC guarantees you some of the most dedicated, highly qualified industry leaders who genuinely want to help in any way they can. The reason that NMC values small American business so much is because they are a huge part of the very foundations that have made us successful. We are not only for small business, but we understand business. It’s what we do. A merchant cash advance is not a loan. Our cash advance programs allow small to medium size businesses, like yours, the opportunity to acquire the capital they need quickly, efficiently and hassle-free. SMART – Because this is not a loan there is often NO Personal Guarantee, or the Collateral required as when applying for a small business loan. We simply secure your cash advance against a portion of your future receivables. Less stress makes this a very SMART move for many merchants just like you. FAST – The money can appear in your account in as little as 3 business days. How's that for FAST! EASY – With our high approval rate, getting your cash advance is easy. 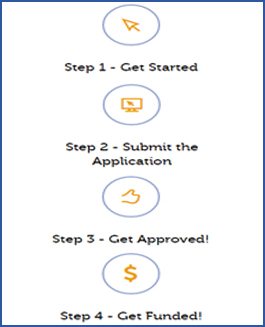 Bad credit is no problem and it only takes 5 minutes to apply. The best part is you never write a check to pay us back, making payback as EASY as possible.